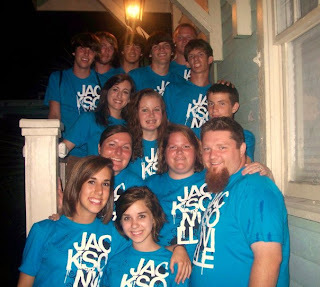 Our summer mission team went to Jacksonville, Florida again this year. The green house on 24th and Pearl has housed us for another week. We had a few new faces and some familiar ones on our journey this year. Teresa, Alex, Jacob, Jarred and Abby were all new to the urban exchange. Expectations were high this year as most were repeat missionaries. However, some things were not as clear as I thought they were. Cultural faux pas aside, we didn't submerge ourselves into the experience as much as I would have liked. We did have some new tasks put upon us this year. As we took on a week of summer day camp. Learning to sing "Jambo" Swahili for "hello", and be ultra enthusiastic about it was a challenge. All of us were assigned different age groups of kids. Ages were from pre-K to maybe the 4th grade. Kimberly, Zach and Matthew had the youngest and largest group. They were amazing with them. Jessica, Alex and I were assigned the next group which had mostly boys. By day 2 I was ready to switch out with Teresa, who was way better at teaching and dealing with the youngsters than I was. I was a grumpy gus most of the week (more about that later). The next group had Andrew, Abby and our new friend, second mile intern, Harin as the leaders. The next group had Jarred, and another new friend, Nic (intern) as the leaders. The last and oldest group had Jamie and (thanks for praying) Ross as their leaders. Ross had his hands full as his group was made up entirely of pre-pubescent girls. He had his hair "did" differently every day. We sang songs under the leadership of an intern; John. John did an amazing job with the help of his sound man, Garret and his "Hype-man" Jamal. John lead the songs and bible story times. Our group did a skit and they asked me to share the story of Jesus death and resurrection with the kids. John did a better job relating to the little kids than I did. I am positive that I over complicated the communication. But never the less the Gospel was clear to kids that week. We had fun with the recreation. After Teresa relieved me from my group, I took her job as snack coordinator, something that is more my expertise. I had a great helper in Bekah. Jacob was on water duty, as he set up coolers of ice water for everyday. He did an excellent job getting the most important thing of the day ready to go. We had devotional and learning times in the mornings. I am not sure what our students got out of it (as I write this I have not been able to debrief anybody), but I was overwhelmed again at how blind I am at injustice and taking care of the poor. I don't mean giving the poor a hand out, I mean being conscience of how I can help. There are already exsisting agencies that could use my time and my presence. It was hot. The guys slept upstairs in what some dubbed as Sheol. We had a few fans, but it was just to push the hot air around. I would literally wake up because my pillow was soaked with my sweat. I only say this because I know that there are houses in that neighborhood that do not even have fans. It was difficult to get a good nights sleep. I was usually the first one up because I longed to take a cold shower and was awake from the pool I called a pillow. We made it through though. We really had no complaints. Mostly just jokes surrounding the utter hotness that was the upstairs. I was angry in the flesh because of the lack of good sleep and I sinned with that anger as I let it corrupt my spirit. I was quickly irritated by some of the students actions and I let it get to me. I said some things I shouldn't. And to not let the devil get another foot hold, just know that I repented and asked specific students for their forgiveness. I don't make excuses, I sinned and needed to repent. 'Nuff said. Jacksonville was different and the same this year. Familiar friends and yet we had other tasks and different assignments. And yet once again we came believing we were bringing the Gospel and God showed me again that it is I who is in need of the Gospel, still. I need the crucified Christ because I am a sinner. And I need to realize his resurrection has now made me a Saint that has the hope of the world, Jesus, living inside of him. I am more than a conqueror in Christ Jesus. I'm happy to read about some of the good things that happened in J-ville. its great to read about your experiences in Jax. I've been back in the 'burbs and I'm getting 'hood withdrawals. I had to read last years' blog posts about your trip to Jax in order to get my fix. jp.